Enjoy a gondola ride and a trip to Madame Tussauds las Vegas with the Venetian Gondola Grand Duo Package! Please print this and redeem it at the Madame Tussauds Box Office for your official tickets to the rest of the attractions included in your package. Please note you may be requested to show ID. 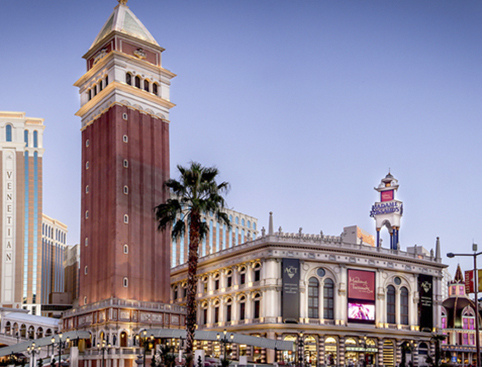 The next best thing to Venice itself is the Venetian in Las Vegas! Featuring its very own Grand Canal, gondolas and even a duplicate St. Mark’s Square, the site of many shops and shows, experience the elegance of Italy amidst the glitz and glamour of Las Vegas. With the Venetian Grand Duo Package you can take in a relaxing outside glide in a gondola, by St. Mark’s Square and under the Rialto Bridge, before rubbing shoulders with celebrities and other icons at Madame Tussaud’s! See the stars of the Strip in the ‘Viva Las Vegas’ exhibit! Elvis, the Blue Man Group, the Rat Pack and even Siegfried and Roy await, performers who have all conquered Las Vegas in the recent and not-so-recent past. You don’t have to experience the gondola ride and Madame Tussaud’s on the same day, so you can spread the fun from your Vegas vacation around! Add a romantic night onto your holiday with the Venetian Grand Trio Package. You’ll be able to take a romantic gondola ride along the Grand Canal, stroll through Madame Tussaud’s together as you stargaze, and finally enjoy an intimate meal together at an Italian restaurant in the heart of the Venetian Hotel. 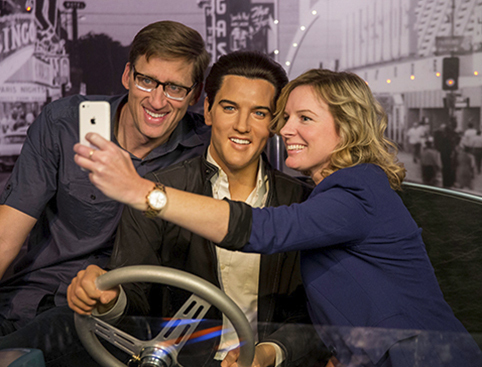 Admission to Madame Tussauds including Cinema 4D Film and Experience. The Trio Package also includes lunch or Dinner at Buddy V's Ristorante. Once in Vegas you will need to take your e-ticket to the box office of Madame Tussauds, where you will get your official coupons for the rest of the attractions. 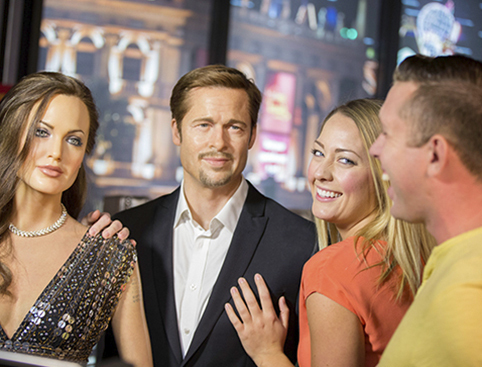 Madame Tussauds is usually open daily from 10am. Closing times depend on time of season. Venetian Outdoor Gondola Ride is usually open daily from 10am - 9pm. Buddy V's is usually open daily from 11:30am - 10pm. Opening times are subject to change. Please check locally for the most up to date information. Please note: The gondola route is currently undergoing an extended re-construction program which may leave operations running slightly differently than normal. Regretfully this is beyond our control and therefore no refunds nor alternatives can be offered.